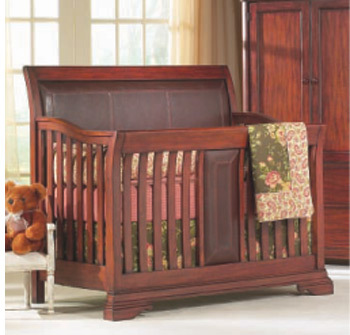 Next in the line of scary cribs from the "Nightlight Gallery," is the coffin crib. I know they say all babies look like Winston Churchill, but you know they aren't...right? This is the crib you buy when you either want your baby to skip ahead fifty-five years to where he becomes an Oxford don interviewing prospective students for admission to Balliol, or believe she actually is Jane Eyre shut up in the Red Room experiencing all sorts of psychological horrors brought on by her forced imprisonment by her evil aunt in the room where her uncle died. Now I don't say that all nurseries need to have bunnies hopping on the walls or clouds scudding across the ceiling, but you if you buy this crib, you have to ask yourself: are you putting your baby to bed in a black hole where all light goes to die? Because that can't be good for their eyes.